One of the distinctive features of the northern Yucatán Peninsula is its almost flat topography, lacking valleys or mountains, and altitudes that barely exceeds 30 meters. The soil type consists mainly of limestone, or saskab (Maya word for “white soil”), which contains calcium and magnesium carbonates that are slightly soluble in water. Millions of years ago the Peninsula was very different from how we know it today, as it has undergone radical modifications due to climate and sea level changes on the planet. An example of these changes was during the Last Glacial Maximum at the peak of the Ice Age – about 22,000 years ago – when the sea level was 120 meters below its current level, and many of the cenotes in which we can snorkel and dive today were dry. Since then, the level of the sea has been progressively increasing more or less gradually and many caves were flooded. 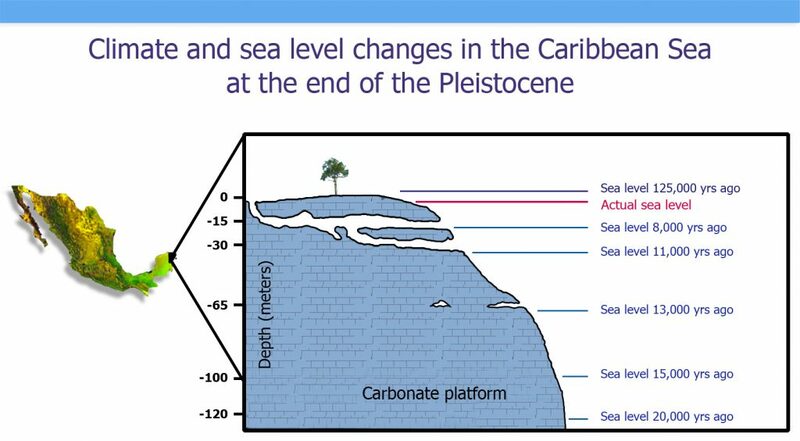 The portion that we inhabit today above sea level of the Yucatan Peninsula, is only the exposed part of the carbonate platform that was steadily growing from the seabed by accumulation of millions of skeletons of different marine organisms that use calcium carbonate to form their bones, shells, spicules and other parts of the body. Upon dying, they deposit on the bottom surface to compact and harden together with fine clays over millions of years. It is important to recognize that the growth of the platform happens through the deposition of biogenic carbonate, sourcing from living organisms, and moreover, that it involves a process that necessarily happens underwater across the submerged areas. Figure 1. The Yucatan Peninsula is the portion that we observe above sea level of the Yucatan Platform, which has a much larger area. In the Riviera Maya on the eastern coast of Quintana Roo, the change in depth is very abrupt compared to northern Yucatan and the Campeche Sound towards the Gulf of Mexico, where the shallow platform extends for several kilometers. Bathymetry: Secretaría General de Oceanografía, Secretaría de Marina, Mexico (YUCATAN ’85). SRTM model of elevation: NASA (2000). Sea level has changed position several times during different glacial periods; therefore, the growing Peninsula has not really “emerged from the sea” but has been exposed and submerged by the ocean on several occasions. However, it is recognized that every time a glacial cycle begins, the Peninsula effectively “emerges”, since the water of the oceans accumulates in the form of ice at the poles of the planet and the sea level drops, exposing a greater surface and increasing the coastline extent. Figure 2. Changes in sea level during the last 800,000 years. The present is on the right. LFI (Last Full Interglacial); LGM (Last Glacial Maximum). Data from Siddall et al. (2003). Currently, the term cenote is used to designate any underground space filled with water that contains a window to the outside. The Maya people, who not only had knowledge of these manifestations of the land but used them daily as a source of water and farming, called them ts’ono’ot or d’zonot, which means “water deposit”. The freshwater supply in the Yucatan Peninsula has been and continues to be a serious problem for its inhabitants. Although more or less abundant rains fall during four months, the period of drought is usually severe and can last up to six months in some years. On the other hand, the calcareous geological origin causes that water is hardly conserved on the surface. For this reason, cenotes and cave systems constitute a primordial source of water for the region. Figure 3. Cenote Xtacumbilxunan, in Bolonchén (‘nine wells of water’) Campeche. This town escaped the cholera epidemic of 1833. The only source of fresh water flows in the depths beneath thick layers of limestone. Lithograph by H Warren. Image published in “Views of Ancient Monuments in Central America, Chiapas and Yucatan” – Frederick Catherwood (1844). In the present, although certain practices of veneration subsist, it is clear that it’s meaning is far from what it was for the ancient Maya. Nowadays, its value is mainly associated with tourism. 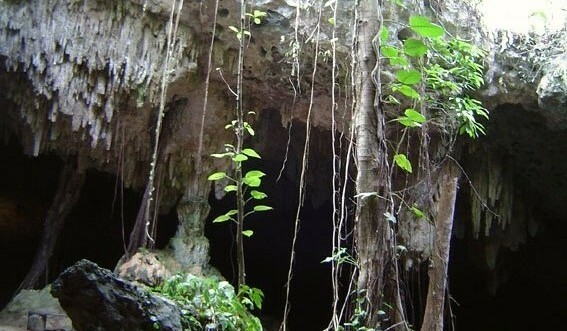 It is known that Quintana Roo has several of the largest cave systems in the world. Recent explorations carried out by divers’ teams have uncovered hundreds of kilometers of underground conduits (it was recently announced a connection between two of the most extensive flooded cave systems on Earth —Sac Actun and Dos Ojos— now forming the world’s largest known flooded cave, with a length of 353 km, moving Ox Bel Ha to the second place). Moreover, there is also a large number of dry caves of considerable length. We cannot ignore their existence if we want to coexist with them. Figure 4. Light opening. Quintana Roo / Personal archive. EMR, 2011. Sneaking into a cave is an unforgettable experience. The caves tell us about geology, biochemistry, paleontology, archeology, and history. Caves motivate us to know them and to think about their future. Speleogenesis is the word used in speleology and geology to describe the mechanism of formation of all kinds of caverns and caves. 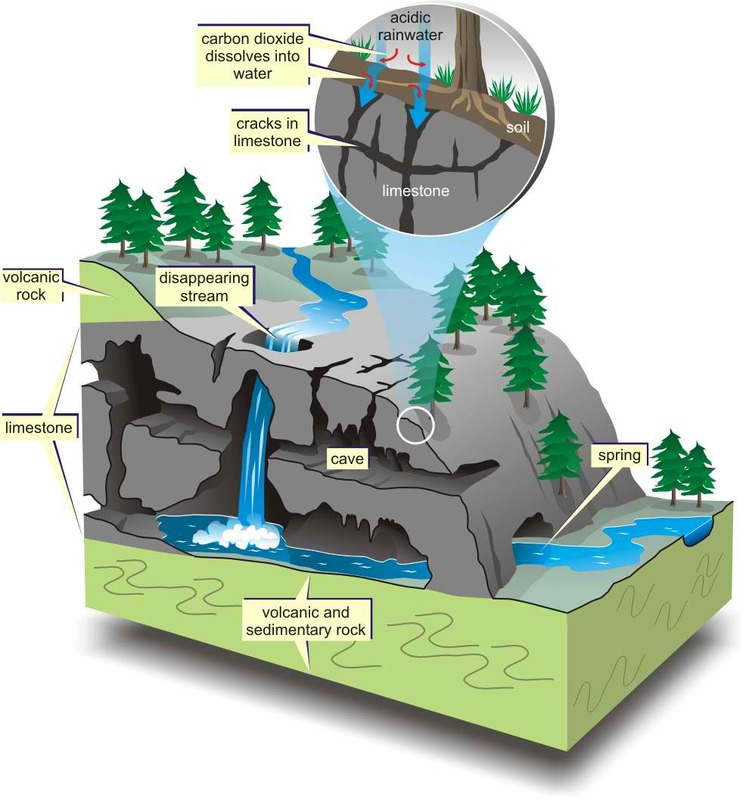 One of the most accepted hypotheses about the origin of caves, cavities, sinkholes, depressions and cenotes, proposes a sequence of steps in a process called karstification, which consists of the combination of at least three mechanisms: dissolution, collapse and re-crystallization of the limestone. 1) In the first step, the rock is dissolved by rainwater acidified by absorption of the carbon dioxide (CO2) both from the air, as well as from the decomposition of organic matter in the soil (leaves, branches, dead animals, bacteria). When mixed with salt water increases its corrosive power. Where the deep salty and superficial layers of fresh water meet, called halocline, is where the greatest dissolution of limestone happens, forming an extensive network of conducts, caves and caverns. Cave divers can see that generally just above the halocline the caves are generally wider, a sign that the dissolution is greater at that depth and that is a continuous developing process, still happening. Acidified rainwater dissolves calcium carbonate from limestone more easily and forms calcium bicarbonate, a much more soluble compound. Another type of solution, but of biological origin, is that which occurs inside some deep cenotes where specialized bacteria decompose the organic matter producing hydrogen sulfide (H2S), a powerful corrosive gas, and when dissolved and concentrated on the surface of the halocline, it is observed in the form of a “smokey cloud” that is very toxic for oxygen-breathing organisms like us. Upon contact with the surface layer, which may contain little amounts of dissolved oxygen, hydrogen sulfide is transformed into sulfuric acid (H2SO4), also a strong and corrosive acid. Figure 5. Karstification mechanisms. Source: McColl et al. (2005). Geological Survey of Canada . 2) In the second mechanism, when the sea level has dropped during glacial periods, the hydraulic head of the aquifer, the freshwater lens, also drops leaving submerged caves now full of air where, lacking support, different sections of the roof can collapse forming a sinkhole or cenote. At the end of the glacial period, the poles thawed and sea level rose and many passages and caves were flooded again. Figure 6. Changes in sea level at the end of the Pleistocene epoch, which began 2.5 million years ago setting up the modern glacial periods. When the sea level changes, the position of the halocline also changes and the cave systems begin to form and extend. Modified by González-González et al (2008) and Blanchon & Shaw (1995). 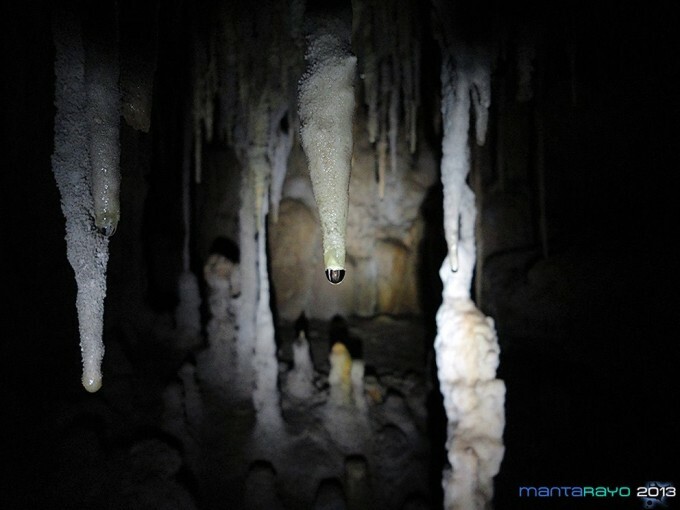 3) Finally, the third step associated with the process of karstification is responsible for the formation of stalactites, stalagmites, columns and other speleothems, by accumulation of dissolved material sourced by the first step. Degassing is also involved in the formation of speleothems: Water filters through the rocks and enters the cave environment, very different from that of the outside, and expulsion of CO2 from water causes calcium carbonate precipitation. In the case of flooded caves, this process no longer happens. The degree of karstification depends on factors that operate with different spatial and temporal scale, which allows a great variety of shapes and decorations in the cave systems. Figure 7. 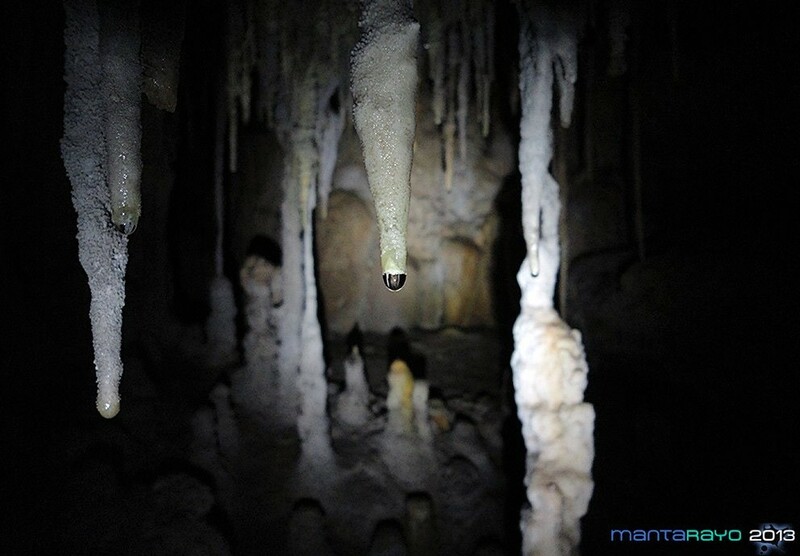 Drop of water with dissolved calcium carbonate, suspended from the central channel of a stalactite. Quintana Roo / Personal archive. EMR, 2015. Having these mechanisms in mind, we can say that the formation of some cenotes is generated through a sequence of events: first of all, a network of passages, conduits and cave system is formed by water carving its way out to the ocean dissolving the carbonate rock. This flooded cave can form a cavern-type cenote due to partial subsidence of the roof. This process advances from above, by infiltration of the rain and from below, by underground circulation. Then, the entire roof collapses forming a cylindrical cenote (although many cylindrical cenotes can have a bottom-top hypogenic origin, keep reading below); if sediments and debris interrupt the flow, a body of stagnant water called aguada, is formed. However, scientists prefer to classify caves, sinkholes and cenotes by their mechanisms of formation -their espeleogenesis- rather than by their present morphology. The largest dissolution occurs in the halocline zone, the contact between fresh and salt water, which rises or falls depending on the sea level. 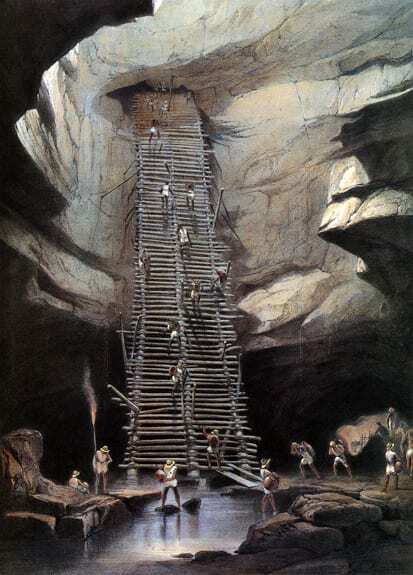 For this reason there are different levels of horizontal caves (for example, in the “Dos Pisos” system). By changing the sea level, the halocline moves and begins to dissolve the rock at a different depth, thus beginning another “level” of passages. The halocline stratifies the cenote: it functions as a physical barrier that isolates the layer of fresh water from the deep saline waters. In the coastal sinkholes, the deep marine layer is not always really stagnant, but can circulate driven by tides and storms through channels connected to the sea (a very clear case is the discharge from Cenote Manatí to the shore in Tankah). We also observe freshwater springs called “ojos de agua” discharging fresh water to the ocean and exchanging salt water along the reef lagoon in Puerto Morelos and on the shallow water beaches south of Tulum. Figure 8. Diagram of the Yucatan Peninsula, where the groundwater is separated into two layers of different salinity and density: the shallow freshwater lens and the deep saline intrusion that filters through the rock. The mixing zone between the two layers is called halocline. SGD: Submarine Groundwater Discharge surfaces creating freshwater springs at the adjacent coastal ocean. EMR, 2015. Cenotes are complex aquatic systems generated by the dissolution of carbonates and other minerals in the rock, so in geology they are also called dissolution lakes, although in reality some cenotes are more similar to rivers than lakes, since they have connections to underground ramified streams that favor the circulation of water. These types of aquatic systems, where fresh and salt water coexist, are called anchialine. The intermittent collapses along the different cave systems of the Peninsula create open windows towards the surface where we can enter and dive submerged conduits and passages. Generally the cenotes in the eastern part of Quintana Roo are formed by the collapse of cave systems formed over very long periods of time, when the depth of the halocline has remained for a long time more or less in the same position, extending horizontally. 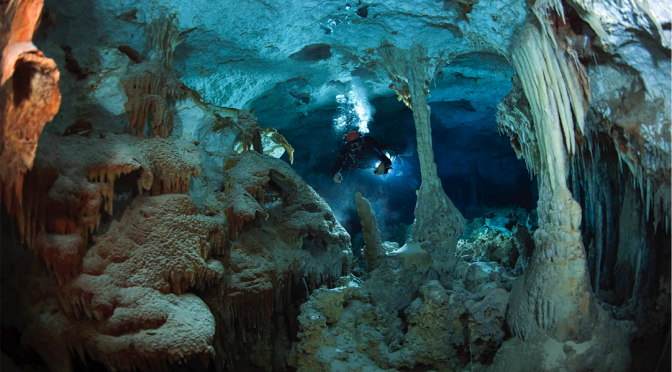 Popular cavern and cave diving destinations in the Riviera Maya such as Sistema Sac Actun (recently connected to Sistema Dos Ojos), Sistema Ponderosa, and Sistema Ox Bel Ha belong to this category. Figure 9. Comparison of different types of cenotes with different formation mechanisms. Left: Pit-cenotes that predominate in the center of the Peninsula and along the Ring of Cenotes. In them, deep flowing water circulation is probably involved, favoring the dissolution of the rock from below advancing upwards. Right: Morphology of the most common cenotes found in the “Riviera Maya”, the eastern coast of Quintana Roo. These cenotes are the entrance to systems of shallower caves normally presenting wide galleries and branched passages. EMR, 2015. Another type of cenotes, more common in the center of the Peninsula, like those located at the Ring of Cenotes, are the so called pit-cenotes (although there are some pit-cenotes in Quintana Roo, for example the Blue Abyss or The Pit, which exceed 120 meters deep) where its formation mechanism surely involves deep water circulation, growing from the bottom up, a process acting from below called hypogenic. Figure 10. Some of the cenotes of the “Ring of Cenotes” in the northwest part of the Yucatan Peninsula. 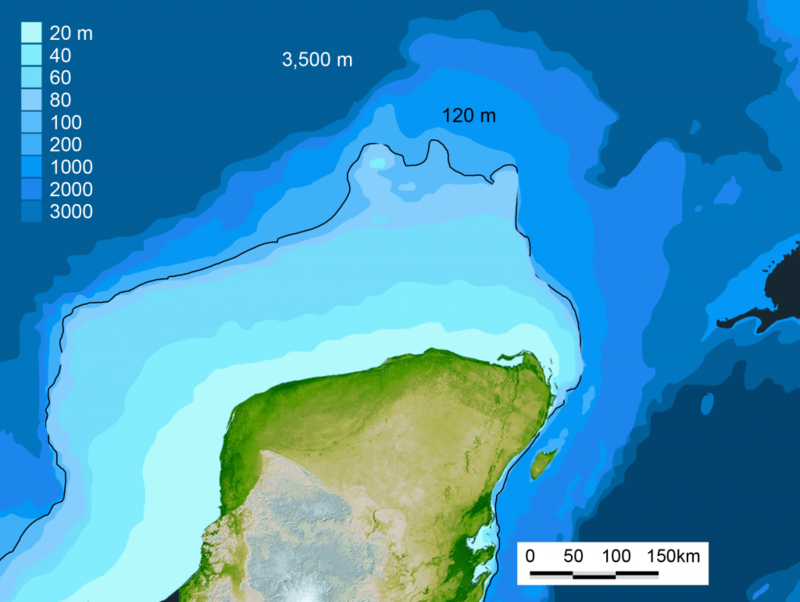 Chicxulub shows the approximate location of the center of the crater created by the impact of the meteorite 66 million years ago. EMR (2018). To achieve a sustainable use of these systems, it would be ideally to acquire a comprehensive understanding of cenotes, caves, groundwater circulation and its interaction with the rocks that form the aquifer, and the influence of oceanic tides. It is also necessary to evaluate the impact of urban areas and the possible causes of pollution of the only source of fresh water in that area, which is precisely groundwater. Research efforts on study and conservation of the underground network of conduits must occur by convergence between environmental sciences, water sciences, earth sciences, biological sciences, joining forces with local communities, efficient exploitation of resources and, of course, exploration and sustainable use by cave diving. 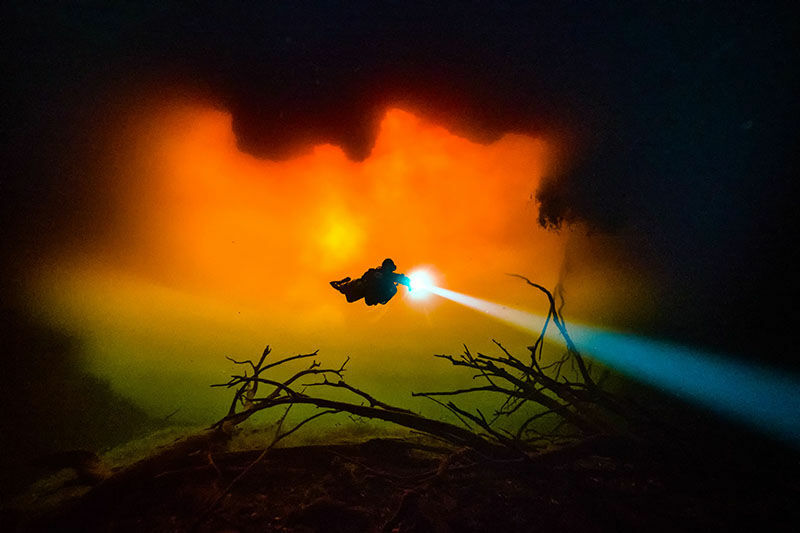 An award-winner picture from Nature’s The best science images of the year 2017 shows a cave diver penetrating the underground aquatic systems in the eastern coast of the Yucatan Peninsula. We can see dead trees resting quietly at the bottom. ORANGE ABYSS: Heavy rains and run-off from surrounding forests give this underwater cavern — the Cenote Aktun Ha (Carwash) off Tulum on Mexico’s Caribbean coast — its eerie tannic glow. Monroy-Ríos E (2017) Speleogenesis: How were caves and cenotes formed? Environmental Biogeochemistry – Personal blog. Published on Dec 26, 2017. Accessed: [dd / mm / yy]. Blanchon P & J Shaw (1995) Reef Drowning during the Last Deglaciation: Evidence for Catastrophic Sea-Level Rise and Ice-Sheet Collapse. Geology 23: 4-8. González-González AH, C Rojas-Sandoval, A Terrazas, M Benavente, W Stinnesbeck, J Aviles, M de los Ríos & E Acevez (2008) The Arrival of Humans on the Yucatan Peninsula: Evidence from Submerged Caves in the State of Quintana Roo, Mexico. Current Research in the Pleistocene. Special Report. 25: 1-24. NASA (2000) Shuttle Radar Topography Mission. Colored elevation SRTM model of the Yucatan Peninsula. QRSS (2016) Quintana Roo Speleological Survey. Actualizada el 19 Abril, 2016. Consultada el 15 mayo 2016. Siddall M, J Chappell & EK Potter (2007) 7. Eustatic sea level during past interglacials. Developments in Quaternary Sciences 7: 75-92.